I first came across the idea of using a powdered clay based toothpowder when I met a woman selling it at the Offgrid Festival three or four years ago. Until then, I had been using a fluoride free toothpaste from the local whole food shop (no artificial sweeteners, SLS etc) which was fine – however trying this was a revelation! It made my teeth feel really clean and felt so much healthier and pleasanter in my mouth than toothpaste. I love making things for myself rather than buying them where possible (I had to buy the ingredients but you know what I mean…), it lasts a long time, is cheap to make and can easily be stored in old jam jars, so doesn’t require any fancy storage or equipment. 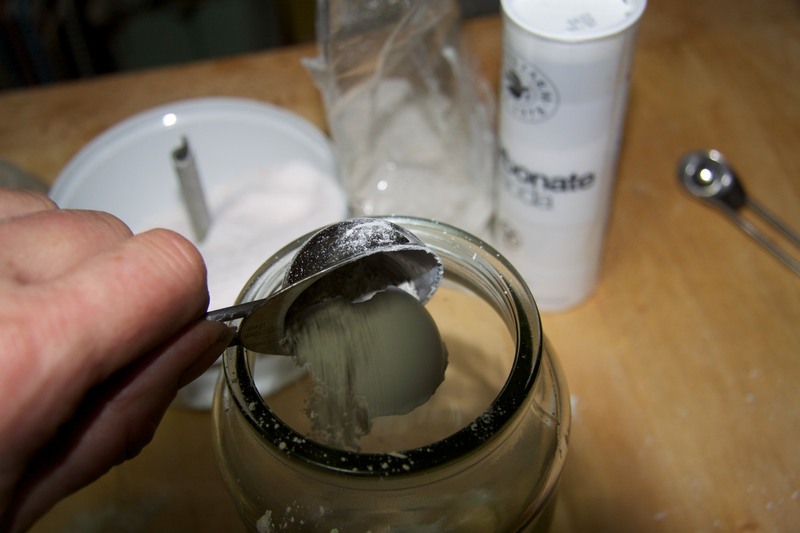 When the powder ran out, I bought Bentonite clay from Earthfare in Glastonbury in order to make my own using just three ingredients – Bentonite clay, sea salt and bicarbonate of soda. This toothpowder keeps my teeth clean, helps to remove toxins and also can help (according to what I have read) remineralise my teeth. It is also very cheap and easy to make. Bentonite clay naturally detoxes and can help eliminate toxins, it is also full of minerals which are beneficial for gums and teeth. Bicarbonate of Soda, which gently whitens and polishes teeth, is an ingredient found in many commercial brands of toothpaste too. Sea salt is also rich in minerals, removes tartar, whitens teeth and is beneficial for oral hygiene. I make a sea salt mouth wash sometimes, a teaspoon dissolved in warm water, a technique recommended by my dentist. Put everything in the glass jar. Shake it to mix well! And there you are – a jar of toothpowder. If you like, you could add some finely ground dried mint for flavour but I like it just like this. I keep a small jar of this in my bathroom cabinet, refilling it from the larger jar when needed. This helps to keep the powder dry and fresh. To use, just dip your toothbrush in the powder and brush and rinse as normal.